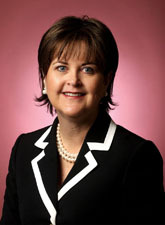 Dr. Shourds was one of 5,500 people nominated by members of the community as a Connector. Leadership Louisville Center used a web-based survey and sophisticated analysis to identify a dream team of existing and emerging leaders. Following this announcement of the Connectors, project consultant Dr. Karen Stephenson will map and measure the leadership networks of the group. Three committees chaired by Leadership Louisville Center board members will be responsible for the strategic direction of future phases of the Connector Project. These include: planning a recognition event for the Connectors, conducting research to find leadership lessons from the Connectors and guiding the next steps of the project. The Leadership Louisville’s Connectors recognition event is planned for late summer. Dr. Shourds is deeply involved in the community. She is the immediate past chair and current board member of the Community Foundation of Southern Indiana and also serves on the boards of One Southern Indiana, Jeffersonville Carnegie Library Foundation, First Savings Bank Foundation and the YMCA of Southern Indiana. She is past chair of the Leadership Southern Indiana board and Campaign Cabinet member of Metro United Way. Chancellor Shourds also helped establish the G.I.R.L.S. (Giving In Real Life Situations) group, which is a giving circle created in 2005 as a grass roots effort to provide support for women and girls in need in Southern Indiana. Past board service includes the Bob Hedge Park Renovation Steering Committee, Falls of the Ohio Development Committee Member, Rotary Interact Sponsor, Junior Achievement Volunteer, Focus Louisville Alumni Group, IUS Mentoring Program Volunteer and Youth Count Partner Network Member. Through her leadership and vision, Ivy Tech Southern Indiana has emerged as a thriving comprehensive community college. The campus has experienced unprecedented growth in student enrollment and number of graduates. The campus has also led all Ivy Tech regions in student retention, helping more students stay on track as they pursue their higher education goals. In 2007, Dr. Shourds secured state funding for a $20 million capital expansion to build a much needed 80,000 square foot classroom building while also renovating the current main campus facility. Work on this long awaited project began this summer. She also forged the first 20-year campus development plan for the region, charting future building projects for the nearly 100-acre campus. Dr. Shourds holds a Bachelor of Arts in Consumer Studies from Indiana University, a Master of Science in Human Resource Management from the University of Louisville, and a Doctorate in Leadership Education from Spalding University. Dr. Shourds is the proud mother of two young daughters, Reagan and Kendall. She, her husband Gary, and their daughters reside in Floyds Knobs.